FROM “THE CREATION OF ANNE BOLEYN”. DO NOT QUOTE OR CITE WITHOUT APPROVAL OF SUSAN BORDO. 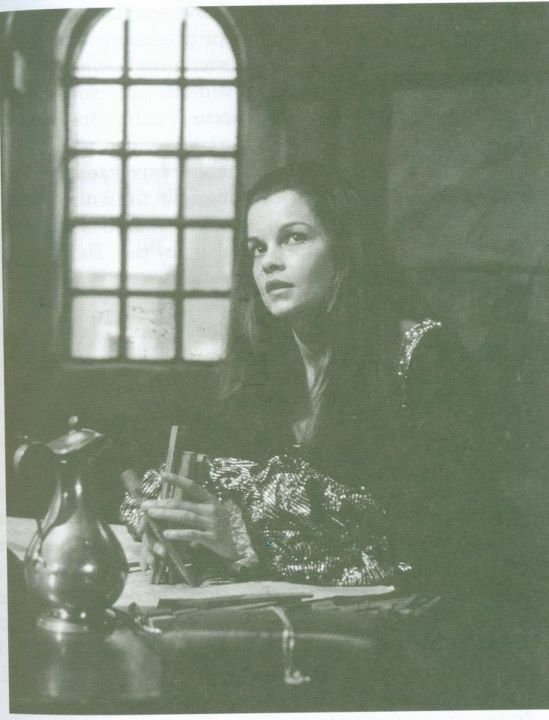 Casting Genevieve Bujold was Hal Wallis’s smartest decision in making Anne of the Thousand Days, and he did so without benefit of a screen-test or even a personal interview, simply on the basis of viewing her in the French-Canadian film Isabel (1968, and directed by then-husband Paul Almond). In 1964, when Wallis first acquired the rights to the play, The New York Times had announced that he was negotiating with Elizabeth Taylor and Richard Burton to play the roles of Anne and Henry. But unless Wallis is lying in his autobiography, he never actually considered Taylor for the role. He recalls a lunch he had with her in 1967, in which “Elizabeth hung on my every word. I was surprised by her attention, as there was no part in the picture for her. Over an elaborate desert she took a deep breath and said, ‘Hal, I’ve been thinking about it for weeks. I have to play Anne Boleyn!’ My fork stopped halfway to my mouth. Anne Boleyn? Elizabeth was plump and middle-aged; Anne was a slip of a girl. The fate of the picture hung in the balance. I could scarcely bring myself to look at Richard.” Burton, however, “handled it beautifully. He put his hand on hers, looked her directly in the eye, and said, ‘Sorry, luv. You’re too long in the tooth.’” Any hard feelings were handled by a huge fee for Burton ($1,250,000 plus) and cameos for Liz (as a masked dancer at a ball) as well as Burton’s daughter Kate, and Taylor’s daughter Liza. For Genevieve, to be picked to play Anne was a complete surprise. But her own history had prepared her well to play a young woman breaking through the confinements of convention. She had grown up in a devout French-Canadian Catholic household, and spent her first twelve school years in a convent; in an online biography, she is quoted as saying that at the time she felt “as if I were in a long, dark tunnel, trying to convince myself that if I could ever get out, there was light ahead.” But something about her deep religious training made its way into her attitude toward acting. When asked in 2007 how she prepared for her roles, she answered, “You pray for grace. If you’ve done your homework and, most of all, are open to receive, you go forward…Preparation for me is sacred.” But going forward with her own life required rebellion, as well; she finally “got out’ of the tunnel by being caught reading a forbidden book. Liberated to pursue her own designs for her life, she enrolled in Montreal’s free Conservatoire d’Art Dramatique; while on tour in Paris with the company, she was discovered by director Alain Resnais, who cast her in the acclaimed La Guerre est Finie. Most movies of the late nine-sixties have not worn exceptionally well, particularly with today’s generation of viewers, for whom many of the rebellions of the times seem dated and silly. My students snoozed through Easy Rider. With Anne of the Thousand Days, the passing years and changing culture have had the opposite effect; my students adored it. “Maybe it was predictable and almost too beautiful for the time period,” writes one contemporary blogger, “but the heart of the film is the way in which the complex historical figures are portrayed in a human way. 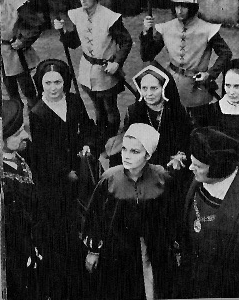 More historically accurate than most films of its kind, Anne of the Thousand Days gave audiences a view into the turbulent world of England on the eve of its reformation as well as a hint at the greatness that was to come from the union of of Henry and Anne.” A view into a period of English history, yes. But most of all, an Anne that seems to become “truer” as the generations have become less patient with passive heroines and perhaps a bit tired by the cutesy, man-focused femininity of many current female stars. Before I said good-by to Genevieve in our interview, I asked her who she would pick to play Anne today. She admitted that she hadn’t seen either Natalie Portman or Natalie Dormer; she lives fairly reclusive life in Malibu, and rarely sees movies or watches television. “But is there anyone who you think would do the part justice?” She was silent for awhile, then asked me if she could be honest. Of course, I said. “Maybe it’s selfish, but…the way I feel….” Genevieve had been so warm and generous throughout the interview, praising all her mentors and influences in her life, she was clearly a bit uncomfortable with what she wanted to say. So, I pressed a bit more, and she responded, with an intensity that recalled her performance and made me smile with delight. Comments from readers of The Creation of Anne Boleyn Facebook page!